I have never enjoyed being in the midst of a crowd. I like to have a bit of space. However, crowds are a fact of life. I have been a part of a crowd at churches, athletic events, airports, the streets of New York City, on a crowded expressway in Chicago, or a crammed subway in Lisbon. Crowds can make us lose our individuality. We seem to merge into the crowd as an unknown and unimportant face. You can see this at an athletic event when somebody begins the wave. What do we do? We conform and stand up and wave our arms when it is our turn. Also, I have noticed this when you see a subway train pass the opposite direction, the people look like one massive block of humanity. The crowd seems to swallow up each person. This crowd mentality has also filtered itself into our Christian faith. We want to belong to a large group. We want to follow the new trend in Christianity. If the crowd says, we dress a certain way to church, then we dress that way. If the crowd says a certain kind of music is better for today, then we follow the crowd. If the latest Christian celebrity makes a pronouncement, then we follow his words like the rest of the crowd. Churches are looking for a crowd. They want to emulate the mega church that is in their city or on the television. A crowd equals success in the eyes of men. The church can easily lose sight of God and His working in the lives of individual people. The danger of this crowd mentality is that we can use people to build our ministries, instead of using our ministry to build people. The Bible often shows the danger of the crowd. Joseph’s brothers were gathered together as their brother, Joseph approached. None of these brothers alone would have thought about killing him, but together they came up with their evil plan. Nobody was willing to speak out openly against the plan of the crowd. The crowd can make us commit evil deeds which we would not do alone. When the nation of Israel was at the border of the Promised Land, the twelve spies had returned with their report of the land. The crowd said that it was too difficult and the people became disheartened. There were only three people who were willing to stand against the crowd, Caleb, Joshua and Moses. They were nearly killed for their courageous stand. The crowd can make a coward of us all. In the time of Elijah, the crowd worshipped the false gods of the surrounding nations. The crowd had rejected the True God. Elijah went against this crowd in his great contest against the prophets of Baal. The majority said that Baal was god. They were proven false by the God of Elijah. The crowd can cause us to turn our backs on the true God, to follow their false gods of materialism, fame, pleasure, and self-centeredness. 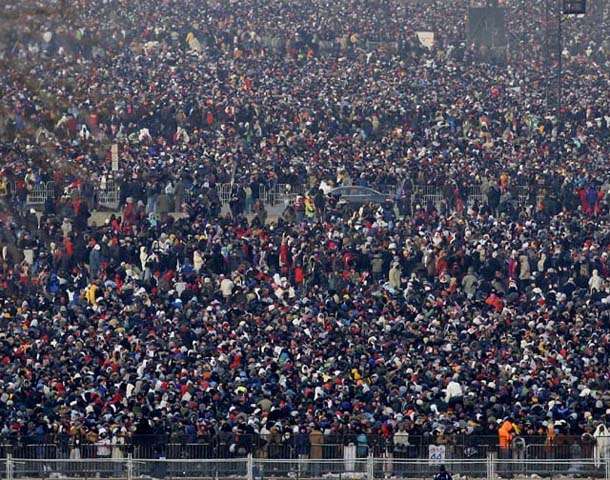 When Jesus walked on the earth, he would often attract a crowd, but the crowds were very superficial in their dedication to Jesus. After Jesus feeds the five thousand, he teaches the people about His deity. As a result. the crowd walks away because their faith was based upon what they could get out of Jesus. The crowd can cause our faith to become quite superficial, because we no longer see the need to develop a personal walk with the Lord. Whatever our “crowd” says is what we believe. We become sheep following other sheep, instead of sheep following the Shepherd. Jesus also warns us about the danger of the crowd when He says: “Enter ye in at the strait gate: for wide is the gate, and broad is the way, that leadeth to destruction, and many there be which go in thereat: Because strait is the gate, and narrow is the way, which leadeth unto life, and few there be that find it.” (Matthew 7:13-14) The crowd has the idea that everybody is going to heaven. We can live as we please. The crowd has led many people to Hell because of their false notion of universal salvation. Thanks for sharing Mark!!! True words of wisdom. I think I may be battling some of this mentality at our church. It is frustrating!!!! God IS GOOD!!!!! HE is Faithful!!! we do not need to “dres up” the Gospel so others will come and follow! Thanks for taking the time to read this post. I also thank you for sharing it on your FB page. Keep up the good work for the Lord. Next Next post: Am I a Spiritual Demolition Expert?